Just the thing to layer over your practice gear and make it show worthy!! Samples, overstock, and one of a kind- Gwen-crafted belts! Save 15 to 20 %! Stock is always changing and most are one of a kind, so check back often and don't delay if its what you want! Priced by individual item. Check the drop down menu to see what is available today! Show Stopping!! Samples, overstock, and hand dyed cholis that did not turn out as expected! Tunics and Kurtas too! Save 15- 30% on Mirrored, Drop Shoulder, Sweetheart and more! Stock is always changing and most are one of a kind, so check back often and don't delay if its what you want! Priced by individual item. Overstock and Samples! 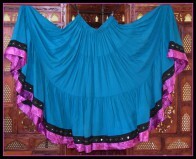 Save 15-25% on 25 Yard Skirts, 15 yard skirts, Spinning Skirts, Double Spinning Skirts and More! In stock and ready to ship! Only one of each! when its gone its gone! Priced by item. Check the drop down menu to see what is available today! Overstock and Samples! Save 15-25% on Cotton Gauze Bloomers, Silk Bloomers, Brocade Bloomers, Village Bloomers and More! In stock and ready to ship! Only one of each! when its gone its gone!